Inside the walk-in cooler at the Food Bank of Lincoln, Nebraska, director Scott Young has milk and fresh fruit from the federal government thanks to a trade-mitigation program that delivered the food despite the partial shutdown. Harvest Public Media's Amy Mayer details some of the ways the partial government shutdown is affecting food and agriculture. The National Agricultural Statistics Service produces a wide range of reports, many of them using data culled from surveys of farmers and ranchers. The January cattle report’s surveys went out on time,but there were not enough people left to collate, analyze and publish the data. Announcements of livestock sales or deliveries of crop exports could be helpful in the reports’ absence, but those also might be inaccurate. More significantly, they won’t be simultaneously available to everyone like the USDA reports. Iowa State University livestock economist Lee Schulz already hasn't been able to put out information he usually provides to farmers because the USDA reports haven't been published on time. A NASS spokeswoman (who is working part-time and without pay during the shutdown) said when the shutdown is over, the agency intends to publish any reports that were missed. Meanwhile, USDA’s Agricultural Marketing Service, which is responsible for price reports, is continuing to publish daily. Schulz said that’s thanks to a lesson learned during the 2013 government shutdown, which left permanent holes in the price records for commodity sales. President Donald Trump signed the massive new farm bill the day before negotiations on funding the government broke down, prompting the shutdown. That means delays in implementing conservation program changes, signing up for crop farming safety nets and launching the new dairy margin coverage program. Bjerga noted that dairy expected to be a big winner in the new farm bill. He’s confident the changes will, eventually, help struggling milk producers. Research at USDA labs is largely halted, though university researchers with USDA grants may be able to continue their work if the universities were given the money before the shutdown. Soybeans are one of the crops affected by the tariff war. The three-day reopening of some Farm Service Agency offices may allow farmers to complete their applications for money meant to help them recover some of those losses. The government's E-Verify software, which ensures job applicants are eligible to work in this country is down. That’s not under the USDA’s purview, but it’s essential for farmers hiring seasonal workers. U.S. Department of Agriculture Secretary Sonny Perdue announced Jan. 22 that all Farm Service Agency offices will open, starting Thursday, Jan. 24, for processing high-priority needs like loan checks and tax documents. 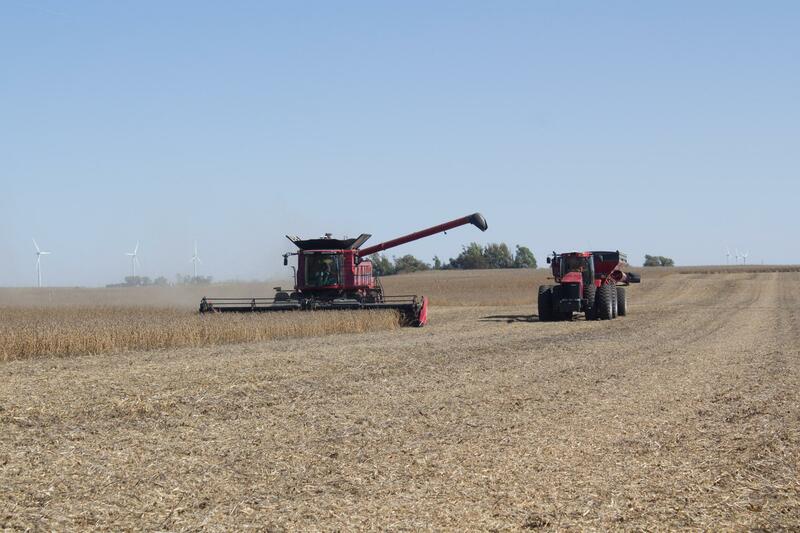 Aaron Lehman grows soybeans in central Iowa, and is eligible for a payment the government is offering to offset lost income from the trade war. But he said the FSA office closures had kept him from finishing the application process, and that’s dealt farmers yet another setback during difficult financial times. USDA has also said farmers can skip some loan payments until the shutdown ends. USDA is responsible for inspecting meatpacking plants, a job that’s gone on uninterrupted. The Food and Drug Administration, which handles most other food inspections, had some hiccups early in the shutdown, but said “high-risk” inspections are back on track as of this week. The Supplemental Nutrition Assistance Program continues, with the government arranging to provide food benefits through February. In many states, people will be getting that month’s benefits early, which is prompting officials to encourage budgeting. But the USDA has said that it has only about $3 billion in contingency funds, which wouldn’t be enough to cover the $4.8 billion it costs to help feed more than 40 million Americans per month. Iowa Republican Senator Chuck Grassley said plenty of people are being left vulnerable. In Nebraska, the Food Bank of Lincoln is encouraging SNAP recipients to conserve their benefits to ensure they last as long as possible. But director Scott Young said they’ve also had an influx of food from a government trade-mitigation program. Crates of half-gallons of milk, packages of grapes, and boxes of watermelons line the large walk-in cooler; there’s even catfish in the freezer. Young says his staff has already helped furloughed FBI and other federal workers apply for SNAP benefits as they watched their first checkless payday go by. He has a message for the others: Food is available; come and get some before you reach a crisis point. The ongoing partial shutdown of the federal government, now into its third week, is reaching ever deeper into the lives of people far from the Washington, D.C., epicenter.